Can you wear a backpack on your travels if you’re not doing stereotypical backpacker things? We had a reader voice her concerns a while back, and it got me to thinking that others might be in the same boat of apprehension and worry. I wanted to take this episode to have a quick chat about what’s really important when choosing your luggage when you travel. Recently, my husband and I traveled to Boston for a long weekend with only a backpack. My husband wasn’t crazy about the idea at first. We’re both in our early thirties and we usually travel with suitcases. But he defiantly changed his mind after a bus ride from the Logan airport to Boston’s city center. The bus was jammed packed and it was over Labor Day weekend, so it was really hot and humid. It seemed like everyone had these large, massive suitcases. I watched as these individuals try to maneuver those suitcases on and off the bus while trying not to trample everyone in their path. At our stop, we’re able to quickly get off and start exploring the city right away without making a special trip to our hotel to drop off our bags. I’ll defiantly be packing a backpack for our next weekend trip to Washington D.C. in October. I’ve really enjoy being mobile with a lighter bag. I definitely think there is an issue (at least for me) of judegment from other travelers. For me that basically comes during the research phase on websites and such. As I’d you should only travel or pack in the way the group at this site likes. Happened to me on a Rick Steves sitr because to them I was an overpacker cause I didnt want to wear paper underwear and use the soap for my body as my shampoo and conditioner (I have difficult hair). Honestly I love the information in my future trips section of Thorn tree forum, but I hate everything about the atmosphere/attitudes there. Like there is only one way to do anything–pack, lack of care what you look like, bathing optional while travelling. That is awesome if you want to travel that way, but no thanks for me! There is an attitude out there that suitcase travelers are ruining the world and other cultures while backpackers are the ‘true/real/only right way to travel’ best. Obviously neither of those things are true or at least not all the time. The way I feel about the attitudes I encounter (and which ones press my personal buttons) clearly show I am a suitcase person in my core, but I think I about to buy my first backpack for our upcoming Thailand trip. To be honest my biggest roadblock in buying a backpack is not wanting to be identified with the backpacker attitudes that I dislike. When I recently realized that was SERIOUSLY my biggest roadblock to trying it out, my conclusion was similar to what you said in your podcast–who cares what other ppl think. When I was still living in the US and working in insurance, I brought my backpack on a few business trips. My boss gave me a weird look and laughed, and I did feel a little weird wearing a suit and a backpack, but I didn’t really care. 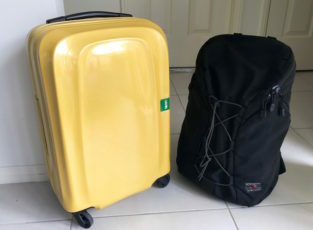 It’s how I was comfortable traveling, and none of the clients we were meeting with ever saw that I had a backpack instead of a rolling suitcase. Go with what works for you and don’t worry about other people’s potential judgement.